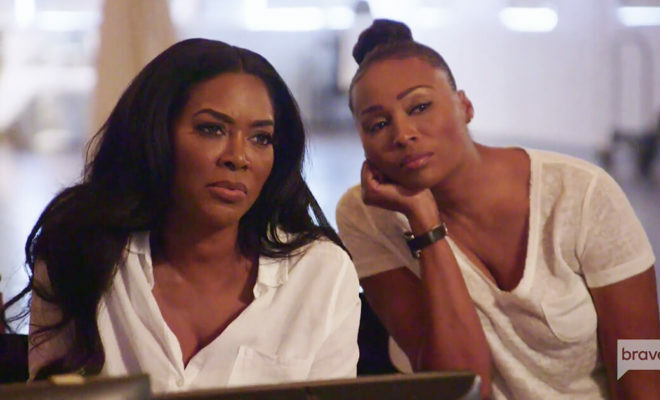 In an emotional moment during last night’s Real Housewives of Atlanta, we saw Kenya and Shereé make an unlikely duo as they joined forces to produce a PSA against domestic violence. The ladies rallied around Cynthia’s Mom as she shared her story. Bravo spoke to Cynthia about her thoughts about her Mom sharing her story, and what it was like working with all the ladies on the PSA. Bravotv.com: What went through your mind hearing your mom’s story? I was sad and proud of my mom at the same time when I heard her testimonial at Kenya’s PSA shoot. My mother has never really openly talked in detail about her domestic issues regarding her past relationships with me and my siblings. We knew that she had dealt with domestic violence in her life, but didn’t know how much, how bad, or how it was still affecting her life today. I know that it was extremely difficult for my mother to address this part of her life publicly and allow her voice to be heard in Kenya’s PSA. Actually, I was surprised when she told me that she wanted to do it, and honestly at the last minute she wanted to back out because she was worried about what her friends and family would say. I encouraged her to pray about it. To follow her heart and her spirit and do what she wanted to do. Not to worry about what the world thinks because it’s her life and her story, not the world’s. I was so proud that she did the PSA, because I know she will not only empower other victims of domestic abuse to standup, but also finally be able to heal herself and get the closure she needs to move on with her life. Bravotv.com: What was it like working with all the ladies on the PSA? I loved working with all the ladies for Kenya’s PSA. I always enjoy coming together for good and not evil, LOL! Although we all have our individual power, we are so much more powerful together.